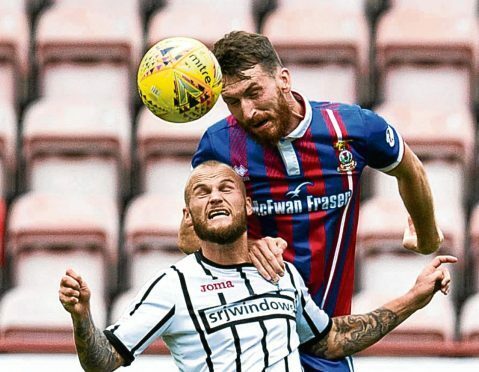 Caley Thistle midfielder Joe Chalmers reckons some of his side’s poorest displays were saved for East End Park last season and he is seeking redemption against Dunfermline in the Championship today. After being hammered 5-1 by the Pars in the second game of the season last August, Caley Jags were also on the receiving end of a 1-0 defeat to the Fife outfit in March, in what proved to be the Highlanders’ final loss before they finished the campaign with a 12-match unbeaten run. The matches between the sides proved decisive, as Allan Johnston’s men pipped Inverness to the final play-off spot, and Chalmers is out to eradicate painful memories. The 24-year-old said: “It was probably two of our worst performances we had there last season. “We lost twice there, so the boys that were here feel we’ve got a point to prove. We want to go down there and certainly do better than we did last season. “In this league, it’s so unpredictable. You look at the results every week and it’s different. If you ask Dunfermline they will probably tell you they found it difficult coming up here, because we beat them in one game and they scored in the last minute in the other to get a draw, but we should have won that game as well. Since winning their opening match at Falkirk, Inverness have been held to draws against Ayr United and Alloa Athletic, both of which have been reduced to 10 men, while the Highlanders have also missed a penalty on both occasions. Although Chalmers feels opportunities have been missed, he feels big strides have been made since last term, when Caley Jags took just four points from their opening seven matches following their relegation from the Premiership. Chalmers said: “Obviously we always want to win our home games, and we felt we had the chances to win them. We are disappointed from that view. “When we are creating the chances we are just not taking them just now, but it will come to the point where we start taking those chances and picking up more points. “As much as it’s disappointing, we do have to look at the positives as well. We are unbeaten, and have started better than we did last season. Chalmers was one of 13 new additions made by John Robertson last summer, and the former Motherwell and Celtic player believes the Highlanders are benefitting from having a more settled squad this time around. He added: “It really helped that a lot of the signings were done early, we got a pre-season and that time together. That has obviously helped compared to last season. “It was a complete turnaround last year, with so many of us all coming in all at once. “This season, it’s only a few and they can fit into what’s here.